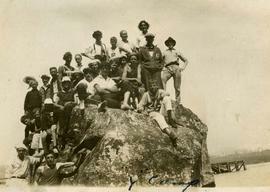 B&W print depicts a large group of unknown boys posing on a rock. "'Y' Camp" is written on the bottom of the image. B&W print depicts an unknown young boy lying on his stomach on grass reading a book. "'Y' Camp" is written on the bottom of the image.Note: colour adjusted on jpg. B&W print depicts an unknown young boy wearing a sailors hat posing beside a tent. "'Y' Camp" is written on the bottom of the image. B&W print depicts three unknown boys sitting in a tent which is built on a wooden platform. "'Y' Camp" is written on the bottom of the image. B&W print depicts two young boys posing in front of a tent. The boy on the right is possibly Irving Snider. "'Y' Camp" is written at the bottom. B&W print depicts a group of unknown boys posing for the camera in the water. "'Y' Camp - Hopkins" is written at the bottom of the image. B&W print depicts an unknown young boy, possibly Irving Snider, standing on top of a large rock on a beach. "Y" is written on the bottom of the phograph. B&W print depicts a camp scene with unknown campers doing exercises in a field and tents in the background. "Y" is written on the lower left corner.Note: colour adjusted on jpg. 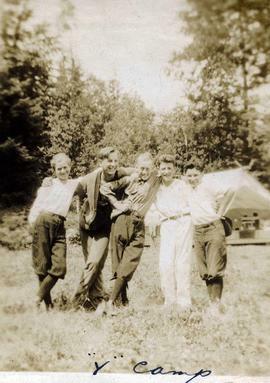 B&W print depicts a group of unknown boys sitting posing for the camera on a field. There is a house and trees in the background. "Y" is written on the bottom of the image.Note: colour adjusted on jpg.